HEROIC PUBLISHING’S TEAM OF HEROES FLY INTO PROSE! ‘LEAGUE OF CHAMPIONS: TERROR TIMES THREE’ DEBUTS! Flare. The Marksman. The Black Enchantress. Doctor Arcane. Lady Arcane. Rose. Icicle. Icestar. Alone, they are heroes. 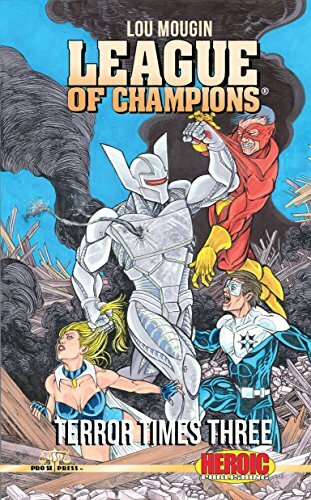 Together, they are a force for justice-The League of Champions, debuting in prose from Pro Se Productions in print and digital formats. In TERROR TIMES THREE, the first prose collection featuring the Heroic Publishing’s premiere team of heroes, Author Lou Mougin pushes the League to its limits! --A demonic entity captures the president, replaces him with a doppleganger, and a handful of heroes face him in the highest-security area on Earth. --A malevolent robot declares war on the human race, but not until he destroys a wheelchair-bound mystic and the allies who stand beside him. --The League must decide whether or not to let their group strength dwindle, or accept the services of the deadliest sorceress of all. TERROR TIMES THREE. and The League of Champions may never be the same again. From Heroic Publishing and Pro Se Productions. Featuring a thrilling cover by Jeffrey Hayes, logo design by Heroic Publishing, and print formatting by Antonino lo Iacono and Marzia Marina, LEAGUE OF CHAMPIONS: TERROR TIMES THREE is available now at Amazon at https://www.amazon.com/League-Champions-Terror-Times-Three/dp/1974262707/ref=sr_1_1_twi_pap_2?ie=UTF8&qid=1501989767&sr=8-1&keywords=league+of+champions+terror+times+three and Pro Se’s own store at www.prose-press.com for 10.00. The first volume of The League’s prose adventures is also available as an Ebook designed and formatted by lo Iacono and Marina and available for only $2.99 for the Kindle at https://www.amazon.com/dp/B074KRRWK8/ref=sr_1_1?ie=UTF8&qid=1501904080&sr=8-1&keywords=league+of+champions%3A+terror+times+three. The ebook is also available for free via Kindle Unlimited for members. EVIL SHALL FEEL THE STING OF JUSTICE ONCE MORE! ‘SILVER MANTICORE: STILL AT LARGE’ DEBUTS!